We Future Cycle had the pleasure of taking the 4th grade students of Post Road Elementary School in White Plains on an environmental Scavenger Hunt. Outside of the lunchroom, We Future Cycle representatives set up a series of colorful “Did you know?” posters which outlined with graphic pictures environmental issues and what can be done by everybody to help. Students got a detective sheet and searched for clues on the posters, all the while learning many details about how everyday behavior impacts our environment. They stared at the mind boggling number of 500 million straws used every single day in the US alone, while cringing at the picture of a poor loggerhead turtle with a straw in her nose. They expressed shock seeing the mountain of garbage floating in our oceans due to litter on land getting washed into the water ways. And they all learned, that everything we do matters. Small everyday behavior changes can make a big impact. The students read through all of the information and were able to answer all of the questions. We had quite a few Girl Scout members participate! Math teacher Ms. Schmidt came by and was very interested in how the posters gave the kids a way of understanding math principles such as percentages and other relative values. Indeed, a very successful day of Scavenger Hunting at Post Road Elementary. 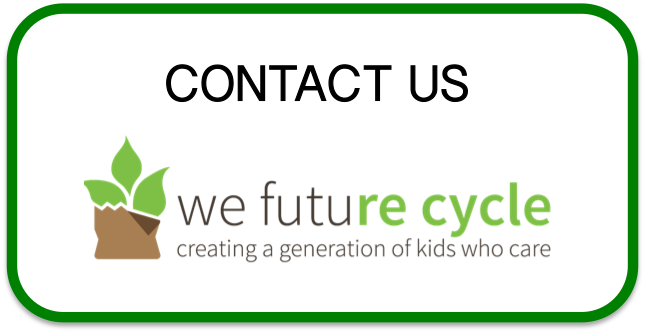 Post Road Elementary School is participating in the We Future Cycle recycling program for 3 years now and all students are total pros when it comes to sorting their lunch waste into compostable, recyclable and non recyclable materials, thus reducing their waste by a whopping 97%. These kind of games help connect their hands to their hearts, making them lifelong agents of change in their communities.